I am so delighted to feature Ann Smarty of MyBlogGuest.com here today because she offers up useful strategies for re-packaging content into other formats to get more exposure for your site. Get your note-taking apps or pen and paper ready because you’ll want to jot down these ideas. Are you a blogger and often find yourself running short on ideas? This happens to all of us, and it is the same block encountered by writer’s of all kinds. In many ways, the problem can be worse for those who make their living writing online. Having to constantly provide fresh content means burning out is inevitable, but taking a break is often not an option. There is just too much to do, and taking steps back from a routine can mean even more steps back in the traffic and loyal readership you have gained. Missing the *visual* social media networks (These include anything from Youtube and Vimeo to Tumblr and Pinterest and even Vibe) if your content is just text. MyBlogGuest does a monthly Google Hangout with the team and a few users discussing the monthly updates (new features, contests, etc). A scheduled hangout is a huge commitments in terms of coordinating, inviting participants, running, editing the video, etc. There’s no reason these efforts can only result in one piece of content. So here’s how we are re-packaging that video content (this article gives more details). By turning our videos into podcasts and online courses, we can spread them out to more networks, reach new audience and actually build brand awareness. Don’t you feel bad about your old articles that never seem to get the attention they deserve… or that have been forgotten for a couple of years? Re-packaging is one of the best ways to give your old articles wings again! Whether it is evergreen or time sensitive, sometimes information just has to be updated. This is a great way to get more traction from an old post, especially since you can use internal linking to direct others back to the original. It is an effective way to get a fresh perspective, draw traffic and establish yourself as an expert with their fingers on the pulse of an issue. Bonus tip: I often use re-packaging tactics for sharing my guest posts on my own blog as well. If I didn’t create a png cheatsheet, my users would have nothing to share on Pinterest (or other infographic promotion channels). If I didn’t create a PowerPoint presentation, I wouldn’t have anything to promote on Slideshare. If I didn’t turn my PowerPoint presentation into a video, there would be nothing to upload to Youtube (videos can also be shared on Pinterest too). ***Every time I write an article, I am thinking of at least two ways to re-package it into other formats: for example, a pdf cheatsheet and a video. Each of these individual pieces are placed on trusted domains and they have good chances to get ranked which, again, in turn will drive traffic back to you (both Youtube videos and Slideshare presentation tend to rank very high in Google!). Bonus tip: With this tactic you can actually target different keywords in Google (which is not always possible when you have only one piece of content). 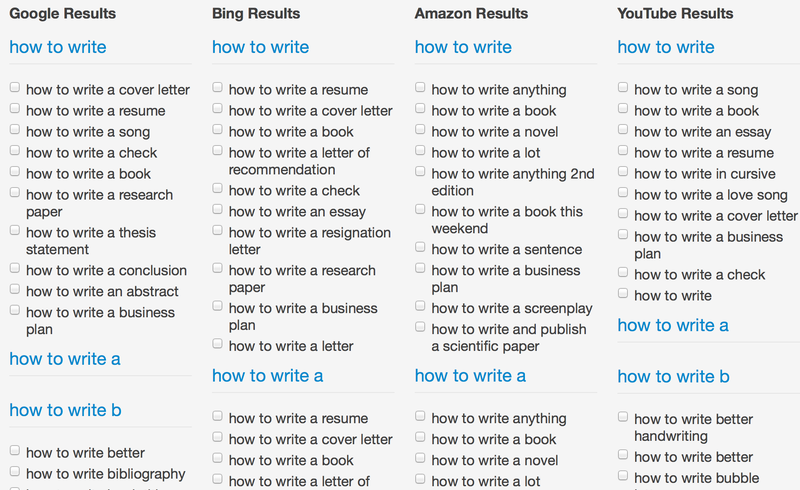 Try this tool to get more keyword ideas! We can seldom manage more than three platforms. 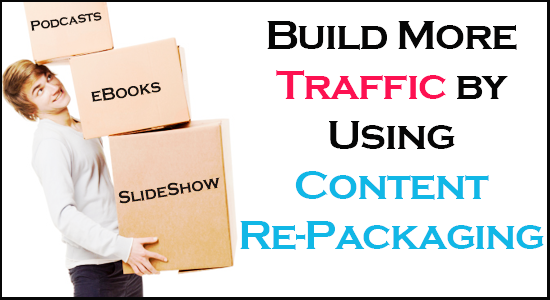 Content re-packaging may help you break that rule because you’ll have more content and more motivation to market it. For example, I never put any effort into promoting the content I put on Slideshare because it promotes itself: I have subscribers there, so I am sharing almost exclusively for them. That means I am building up another separate channel and following! Every social media profile you are building is your brand asset. They can rank on Google for your name and give your followers additional background about what you do and how trustworthy you are. Three results ranked on top come from our podcasts and the Udemy course! Those results are our strongest assets because they convince our users that we are serious about what we do! Thanks to sites like Pinterest, infographics are even getting their own little slice of the social web. What makes them so effective is that humans are visual creatures. We engage better and retain more information when it is provided in a way we can relate to images. Infographics work by presenting quick facts alongside those visual representations. They keep our attention and are easy to remember. They are also highly shareable, and more likely to go viral than text posts alone. Tools to create: For an easy to use infographic maker, try Piktochart or Infogr.am. Sticking with the theme of quickfire information, slideshow presentations are another great way to provide it. This is nothing new, as people have been using presentation software long before it became the norm to share them online. What’s more, these programs are very simple to use, even for those who have no experience making slideshows. Tools to create: You are probably familiar with PowerPoint, but there are others on the web to try. For example, WOW Slider is a great open-source (and so free) creator. Haiku Deck is another one to try! It comes with some great designs and photos! 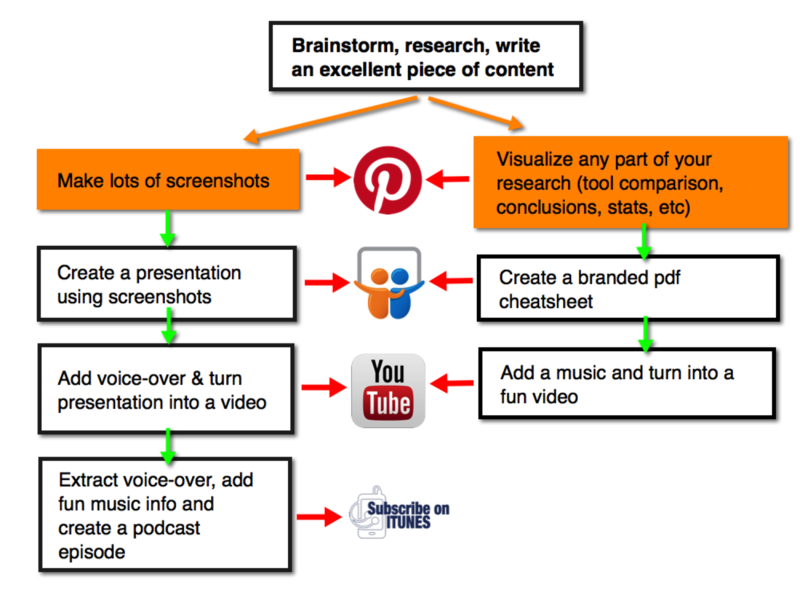 Tools to promote: Slideshare is a good host for uploading and sharing your presentation. It’s awesome for building up your subscriber base too! A podcast is a wonderful way to engage with visitors and to introduce a different form of content creation with readers. Not everyone has time to keep up with blog posts, or even the inclination to do so. But many enjoy having a podcast to listen to as they do things through their day, like commute or workout. You may find yourself with a whole new audience if you begin releasing podcasts. Tools to create: There are podcast makers out there, but your better bet is investing in some decent recording equipment. MakeUseOf did a great post on the best equipment and software for podcasters. 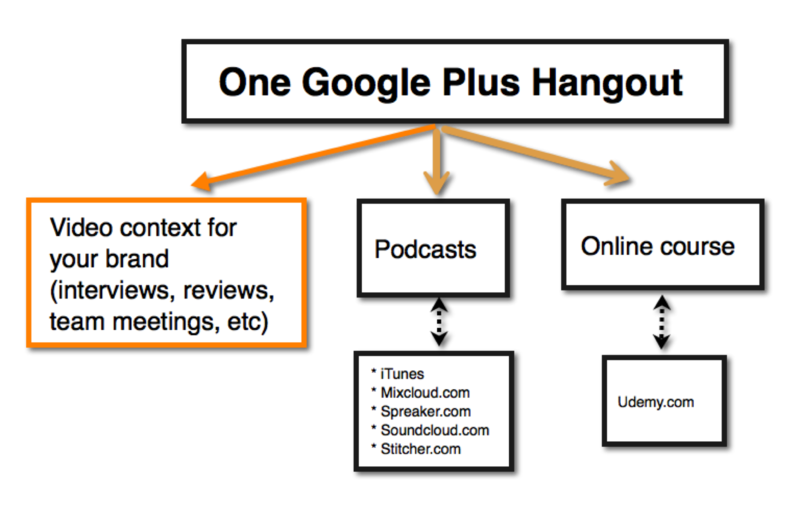 At MyBlogGuest part of our podcasting strategy is re-using sound from Google Hangouts. eBooks are perfect for re-using your old forgotten articles. With tablets on the rise, they are also great for giving your followers something to read at home (when they are offline). They can be great incentives for building an email list too! Tools to create: There may be lots of paid / advanced pdf creation apps but I am using Google Drive (formally Docs). It’s free, easy and it needs no additional software to install on your computer. Re-packaging works wonders for building your content empire and brand over the web, but only when it becomes part of your usual blogging routine. One or two videos won’t change anything, but a strategic plan involving re-packaging tasks on a weekly basis will boost your traffic and brand. Lisa’s comment: I’m glad Ann mentioned this. Often times we try something once or twice, but in order to see results, you have to be consistent. Do you have a tip for re-packaging blog content? Let us know in the comments. Ann Smarty is the founder of MyBlogGuest, the community of guest bloggers preaching high-quality guest blogging, and co-founder of ViralContentBuzz, the social media sharing community putting your content in front of eager influencers. Glad I decided to click on the referral link to your site because I’m getting too busy lately to keep cranking out new content and these Ideas raise a light bulb of clarity into new possibility. This are all fantastic tips. I always think ahead when creating content. I recently started adding my blog post audio to my podcast. That saves me a ton of time and my content stores are adding up quickly. This is really very informative and useful article, Content packaging sounds like a great idea. Thanks for sharing. Thanks for your great suggestion..I am doing the same right now for my blog posts….I used all my old content and modified little bit according to latest Google changes…..Now I found my rankings well…. Excellent article!! Thank you, Lisa, for having such a great guest blogger, and thank you Anne for creatively sharing. MyBlogGuest has been hit really hard by Google. One of my sites just got slapped. Many other people are reporting the same. Lot’s of spammy authors and links. I should have known better. I wouldn’t recommend them and by association Ann Smarty if I were you, Lisa. Aside from that, great advice on your site. I have tried many ideas to make my content more appealing to viewers. but i never though about content re-packaging. Thanks for sharing a creative idea. I will try content Re-packaging for customer engagement. I like to keep an idea file in Evernote and sometimes I’ll even write entire blog posts in Evernote because I can access it from my phone or computer. Beyond that, I am always thinking of how often to post, what kind of content to provide, wheather video, audio or just written articles. Why not all three and get out there on more services where I can get in front of more people? Plus, I also like finding services that automate things so I can work on creating excellent content I know people want and the services take care of promotion for me, or the people, or both. As long as it provides value, I’m down. I am always coming up with new ideas for my site design, layout and page content (other than blog posts, too) and Evernote is awesome for this. I can get pretty much the color, copy and layout I want by tabbing out the words and once the content is how I like it, it’s time for creating it on the site. Nice post, before reading this I was not aware of the idea of repackaging. I will try it in the near future cause right now I am at the begging of building my blog. Thank you for sharing this posts. Thanks a lot Ann… its the most useful article i have found… I appreciate it so much… thanks for sharing. I am really frustrated to drive traffic to my website, whatever I do I don’t see any kind of results. Look at my blog and suggest a tip for me. Lisa Thanks to providing more useful information regarding with Re-posting content. i appreciate you. thank you so much once again. Thanks for including links to tools for each of your suggestions Ann. By the way, how long does it take, on average, to create a Udemy course? Hii lisa I see some of your posts and get impressed with your skills but i wanna know that how to make a forum popular i recently start a forum for samsung devices and get no luck with it, I see that other forum posting guidelines are very tough to follow so i create it with very simple guidelines so please suggest me some tips for my forum. What I did to promote my forum was integrate links from the forum into my site. You never start a forum until you have a site with traffic. It’s hard to launch a forum by itself. These are some great tips here! I’ve just recently started to re-package my content as well to get the most bang for my time :). I take my blog posts and turn them into graphics with my logo on them and pin them on pinterest. I also take the content and turn them into powerpoint presentations and share them on slideshare. Then I take that content and also make it into a video and share on Vimeo and YouTube. All relatively easy to do with a bit more effort. As always Lisa you are my inspiration and your content keeps me going day in and day out thank you so much. Hi Ann, thank you for the great information, i will also try out a few of your methods. Great work Anne, and I’ve been a member and a HUGE fan of your MyBlogGuest sites from day one! Oh thanks so much for all your kind words. It’s awesome to have a fellow MBG family member here! Hey Dean, long time no see. Great to see you here in the comments! Ann Smarty that were some really useful tips. It would not be fear If I don’t say “Thank you” for this useful tips. Time to put them into action. Making the most of the content you put the time into creating is such a great way to maximize the exposure of that content. Thanks for putting this together and giving people some ideas on how to do just that! I am certainly trying my luck with Slide share (I have created one presentation so far, through Haiku deck…and it worked pretty well. 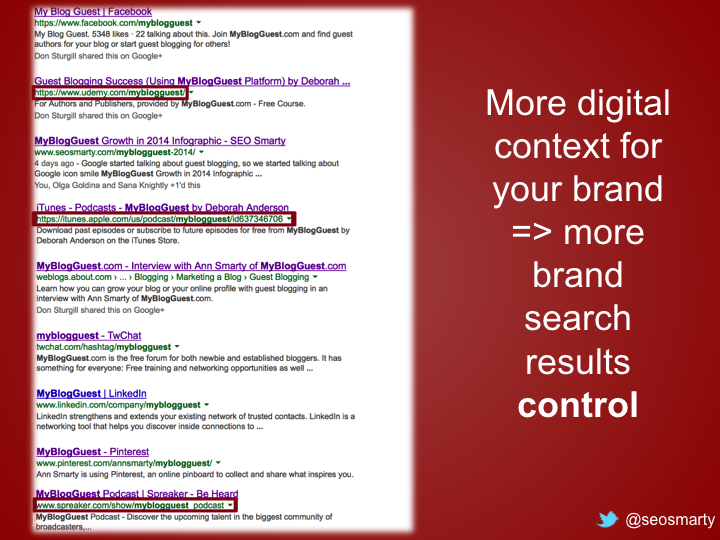 Like you mentioned, Slideshare presentations don’t need much promotion). Loved your point about planning early and think of 2 ways to repackage the content…I will certainly try that with my future posts 😀 (I am adding it to my check list – Thank you Ana). Speaking of repackaging, I have thought about hand written (or drawn) notes/drawing to illustrate my point (I have seen a few people use drawings…perhaps I could experiment with it). I like that effect too. And if you do YouTube videos consider getting a Bamboo tablet (or something similar) to do visuals/drawings while you’re recording the video. That could help make them more enjoyable to watch. Ann thanks for sharing these tips. You did a great job. Have been dilly dallying on creating slideshare but this is a wake up call to me. I am always meaning to repurpose content, but often don’t get around to it. I did use all my twitter posts as a basis for a few Udemy courses though, so that was a win! And today I am posting a review as a video, a first for me. So I am trying! I know it works. Thanks for sharing, Ashley! Repackaging can be tough but like I said it needs to be part of the routine, then it’s easier! Thanks for posting this great article. Finding was to extend the life of our content is something we’ve actually been talking about a lot the last few weeks. We were already doing some of these (older content is being used for our first eBook). This gives us some great guidance (which we’ll be implementing) on some other methods. Truly appreciated. Thanks for your kind words, Luke! I am so happy to hear I was able to give you some ideas on further extending the life of your content! that you can use different places and techniques to get your content out. l definitely use this advice once I learn what IM doing . No problem, June! Yes Ann had some great tips. Thanks for your kind words, June! It feels good to be back on Lisa’s blog! I have been doing this for a while but I didn’t know that it is called Content-repackaging. And finally submit them to respective social platforms. Anyways, thanks for sharing this idea with us. Nice article Ann. Maybe I am the typical ‘nice guy’ and always try to make things more difficult for myself by only using new content. I think your article finally gave me the get-up-and-go to start double and triple dipping into what I’ve already written. I am sure your older content deserves wings, Eric, especially if that’s some creative approach that will add value to the web! thanks for the comment! This is a very great article. I sometimes find myself running out of ideas for new blog post, trying not to make it seem as if I am rewriting articles on my blog. I think this content repackaging is a great idea. I often have ideas for a new post but then think it has already been used on another blog. Truth is that yes it may have been used somewhere else, but it’s the way how we deliver it which will make it different. Thanks for the awesome tips, time for me to repackage my content.